Use the Job Editor to create a new job or to modify the configuration settings of an existing job. The Job Editor opens when you select the New Job icon or the Edit Job icon from the Data Logger Schedule tab toolbar. 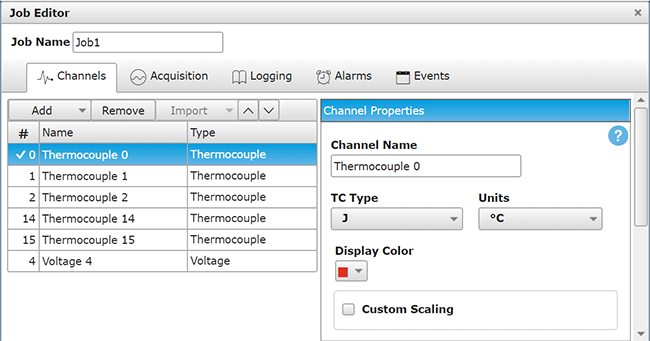 The Job Editor provides a series of tabs to configure channel, acquisition, logging, and alarm settings, and view data acquired for the job. You can advance through the tabs sequentially using the Next button. Tap the Finish button on any tab to save the settings in the job and close the Job Editor. Each saved job appears in the job list on the Data Logger window. You can use the Schedule tab toolbar to duplicate jobs, save job settings to a file, and import job settings from one job to another. The job name is set by default to Job1. You can enter a new name in the Job Name field. Use the Channels tab to view the channels included in the job, add or remove channels, and customize channel properties. The channels list includes the name and type of each channel added to the job. 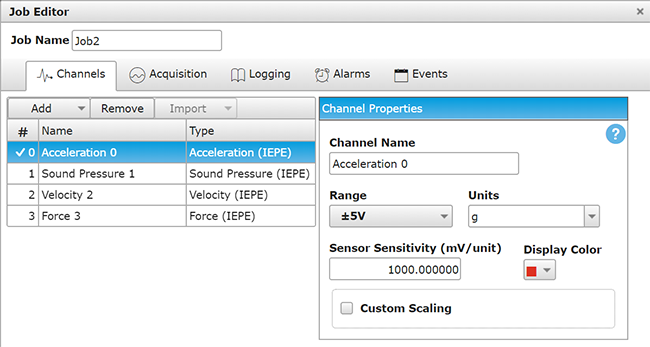 Add Displays the channel types you can add to add to the acquisition. When you select the channel type, a Selected Channel(s) dialog box opens for you to choose the channel number. A channel can only be added once. Click OK to add it to the channel list and display its properties. Refer to Channel Properties below for the specific options you can customize for each channel type. Remove Removes the selected channel from the channel list. Note that any channel configured as a trigger source or alarm source cannot be removed until the trigger or alarm is deleted or its source is changed to another channel. Import Imports the channel list from another job in the job list. Tap the down arrow to select the job list to import from. The Import option is only enabled when the channels list is empty (does not contain any channels). Move Down Moves the selected channel up or down in the channel list. The order of the channel list sets the order of items in the display and in data when it is exported. Channel Name Enter a channel name. For display purposes, enter a name less than 18 characters. This value appears in the channel list. Range Select the range from the drop down list. The values that display are specific to the connected device. Units Select the unit used to acquire data. Custom Scaling Enable this checkbox when you need to convert a measurement to a more useful value, such as voltage to PSI. When enabled, the vertical axis of the strip chart is automatically adjusted to reflect the data being plotted. Multiplier and Offset text boxes display for you to enter custom scale factors. The multiplier is used to calculate the y-axis upper and lower ranges. Offset is the value used to offset each data point. Display color The color applied to channel data on the Dashboard. Tap to open a color palette and select a color. TC Type Select the thermocouple type: J, B, N, S, T, R, or E.
Custom Scaling EEEnable this checkbox when you need to convert a measurement to a more useful value, such as voltage to PSI. When enabled, the vertical axis of the strip chart is automatically adjusted to reflect the data being plotted. Multiplier and Offset text boxes display for you to enter custom scale factors. The multiplier is used to calculate the y-axis upper and lower ranges. Offset is the value used to offset each data point. Coupling Select AC or DC. Configure for DC if the signal has no offset voltage or if the DC content of the acquired signal is important. Sensor Sensitivity Enter the sensitivity in V/unit. Note: AC coupling is automatically enabled for IEPE channels. Use the Acquisition tab to set the sample rate, auto zero mode, and acquisition start and stop settings. 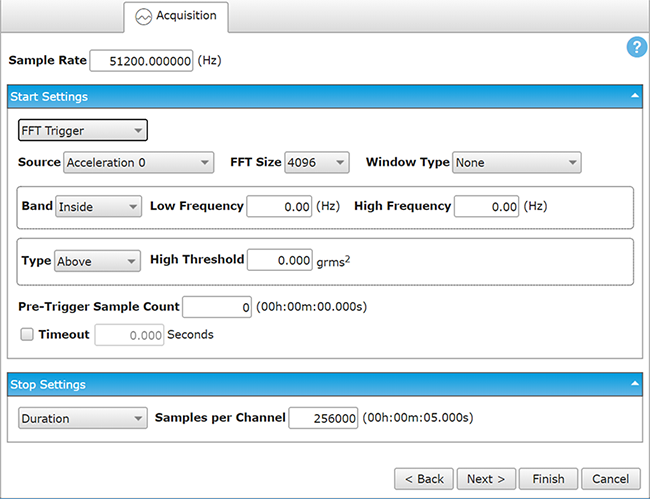 Use the Acquisition tab to set the sample rate, and acquisition start and stop settings. Sample Rate Enter a value in Hz. Auto Zero Specify whether to perform auto zero and compensate for offset errors. When enabled, the internal voltage offset is subtracted from each thermocouple reading, resulting in a more accurate measurement. None: do not perform auto zero. Every Sample: Perform auto zero on every thermocouple reading. Immediate: The acquisition starts when you tap Run All or run a job. Date/Time: The acquisition starts when date and time criteria are met. Enter values directly or use the selector controls to set the date and time. Note: The default time is synchronized with the PC. Digital Trigger: The acquisition starts when an external digital signal meets the trigger criteria. Select the digital bit and trigger type, and enter the number of samples to acquire before the trigger occurs. Refer to Trigger Types below for information about each type. Analog Trigger: The acquisition starts when an external analog signal meets the trigger criteria. Select the analog channel and trigger type, enter threshold values as required, and enter the number of samples to acquire before the trigger occurs. Refer to Trigger Types below for information about each type. FFT Trigger: The acquisition starts when an external FFT signal meets the trigger criteria. Select the input channel, FFT size and window type, enter the frequency and threshold values as required, and enter the number of samples to acquire before the trigger occurs. Refer to Window Types below for information about each window type. Note that the window type set here is independent from the window type you can apply to displayed data with the FFT Plot Settings dialog box. Push Button: The acquisition starts when the device FUNC button is pressed. Duration: The job ends when the specified number of samples are read. The duration dynamically updates with the time entered. Date/Time: The job ends when date and time criteria are met. Enter values directly or use the selector controls to set the date and time. Note: The default time is synchronized with the PC. Digital Trigger: The job ends when an external digital signal meets the trigger criteria. Select the digital bit and trigger type. For pre-trigger data, enter the number of samples to acquire before a trigger occurs. Refer to Trigger Types below for information about each type. Analog Trigger: The job ends when an external analog signal meets the trigger criteria. Select the analog channel and trigger type. For pre-trigger data, enter threshold values as required. Refer to Trigger Types below for information about each type. FFT Trigger: The job ends when an external FFT signal meets the trigger criteria. 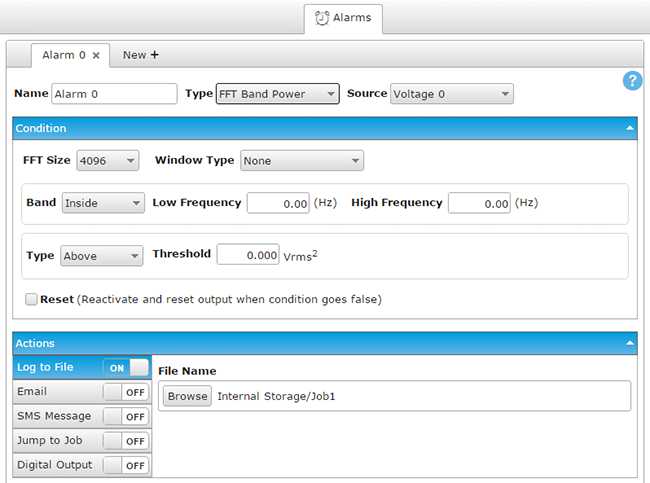 Select the input channel, FFT size, and window type, and enter the frequency and threshold values as required. Refer to Window Types below for information about each window type. Manual: The job ends when this job is stopped from the job list on the Data Logger window. Push Button: The job ends when the device FUNC button is pressed. Source Select the digital bit to trigger (start/stop) the job. Type Rising Edge: Start or stop on the digital edge of a rising pulse. Falling Edge: Start or stop on the digital edge of a falling pulse. Low: Start or stop when the external digital trigger is 0V (logic low or 0). High: Start or stop when the external digital trigger is 5V (logic high or 1). Source Select the analog input to trigger (start/stop) the job. Type Above: Start or stop when the reading at the selected Source channel goes above the Threshold. Below: Start or stop when the reading at the selected Source channel goes below the Threshold. Inside Window: Start or stop when the reading at the selected Source channel is above the Low Threshold and below the High Threshold. Outside Window: Start or stop when the reading at the selected Source channel is below the Low Threshold or above the High Threshold. Slope Positive: Start or stop when the reading at the selected Source channel transitions from below the Low Threshold to above the High Threshold. Slope Negative: Start or stop when the reading at the selected Source channel transitions from above the High Threshold to below the Low Threshold. None Recommended for use when your signal content contains random (white) noise or closely spaced sine waves. Hann Bell-shaped cosine window typically used to analyze continuous signals. Recommended for use when your signal content contains sine waves, a combination of sine waves, vibration data consisting of narrow band random signals, or unknown content. Hamming Bell-shaped cosine window optimized to minimize the maximum (nearest) side lobe. Recommended for use when your signal content consists of closely spaced sine waves. Blackman-Harris Similar to a Hann window, this window has slightly wider main lobe but much better dynamic signal range. It is optimized to provide the minimum side lobe level. Blackman Similar to the Hann and Hamming windows, this window has slightly wider central lobes and less sideband leakage. Flat top Optimized for measuring peak amplitudes of discrete spectral components that are separated by several spectral lines. Recommended for use when your signal consist of sine waves and amplitude accuracy is important. 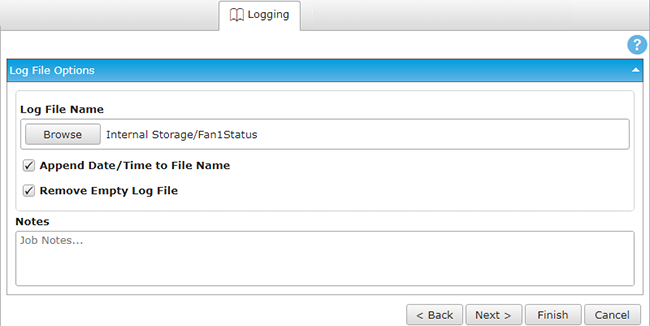 Use the Logging tab to configure data logging and to set logging options. Acquired data is logged to a binary WebDAQ data *.wdd file. You can save logged data to the internal storage on the device, or to an external SD card or USB storage device. Acquiring data at higher speeds can generate large data files. The maximum file capacity of external media formatted with the FAT32 file system is 4 GB. If the log file on FAT32 media exceeds 4 GB, a "File too large" error is returned and the acquisition stops. If you expect to acquire a large amount of data to a single file when logging to external media, reformat the media using a different file system such as NTFS before starting the logging session. Refer to the Frequently Asked Questions (FAQs) topic for more information about file systems. Log File Name: The location and name of the data file. Tap Browse to enter a filename and specify where to save the file — choose from Internal Storage, SD Card, or USB Storage Device. Icons are provided to create subfolders, refresh the file list, and navigate the folder hierarchy. External media must be inserted for the external options to display. Logged data is saved by default to the device internal memory as Job1.wdd. Append Date/Time to File name: Appends the date and time to the filename. Enabled by default. Disable to overwrite the data file upon each run of the job. Notes: Optional information about the job that displays in the file header of the data file. Use the Alarms tab to add an alarm, set alarm conditions, and specify the action(s) to take when an alarm is triggered, such as send a text notification, set the status of a digital bit, or run a specific job. By default, alarm data is saved to a *.txt file in a location you specify — internal storage on the device, SD card, or USB storage device. Each alarm written to the specified file is appended, including repeated runs of the job. When initially opened, the Alarm tab only displays a New tab. Tap to add an "Alarm #" tab with alarm options to configure. New Adds a new Alarm # tab with configurable options. Name The name assigned to the alarm. Keep the default or enter a new name. For display purposes, enter a name less than 18 characters. Type The input type to use for the alarm. Source The channel used to trigger the alarm. FFT channels can only trigger one alarm. Type: The alarm type. The list is populated with the types available for the selected alarm input type. Refer to Alarm Conditions for the available alarm condition types. 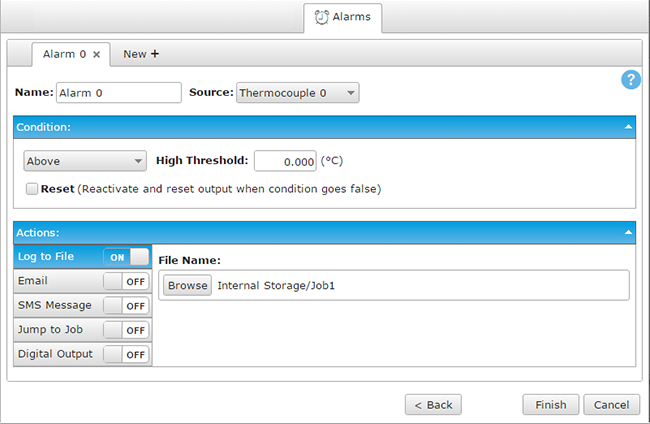 Reset: Enable this checkbox to clear the alarm when the alarm condition is false for the specified interval. Log to File: Saves alarm data in a *.txt file. Specify the name and location where to save the file. Alarm data is saved by default to the device internal memory as Job1.txt. Email or SMS Message: Sends a notification that an alarm occurred via email. Specify the SMTP server from those you set up on the Email/SMS tab. For email notification, add one or more email addresses (separated by semicolons). For text, add one or more phone numbers and the associated SMSGateway. Click the 'Retry On Error' option if you want the WebDAQ to keep trying in the event of a connection error. Note: Email and SMS Message cannot be enabled at the same time. For more information about notification options, refer to Email/SMS discussion in of the Device topic. Jump to Job: Ends the current job, and starts the specified job when an alarm condition is detected. Digital Output: Sets a digital bit high or low when an alarm condition is detected. Source The analog channel used to trigger the alarm. Alarm Type Above: Triggers an alarm when the reading at the selected Source channel goes above the Threshold. Below: Triggers an alarm when the reading at the selected Source channel goes below the Threshold. Inside Window: Triggers an alarm when the reading at the selected Source channel is within the range defined by the Low and High Threshold. Outside Window: Triggers an alarm when the reading at the selected Source channel is outside of the range defined by the Low and High Threshold. Slope Positive: Triggers an alarm when the reading at the selected Source channel transitions from below the Low Threshold to above the High Threshold. Slope Negative: Triggers an alarm when the reading at the selected Source channel transitions from above the High Threshold to below the Low Threshold. Source The digital bit used to trigger the alarm. This cannot include any bit used as an alarm action. Alarm Type Rising Edge: Triggers an alarm on the rising edge of a digital pulse. The alarm condition remains true as long as a rising edge is detected within the reset period (defaults to 1 second). Falling Edge: Triggers an alarm on the falling edge of a digital pulse. Low: Triggers an alarm when the external trigger is 0V (logic low or 0). High: Triggers an alarm when the external trigger is 5V (logic high or 1). Source The FFT channel used to trigger the alarm. Specifies how many data points to use when generating the FFTs for the analog input channels. Tap the down arrow and select a value from the list. Window Type None: Recommended for use when your signal content contains random (white) noise or closely spaced sine waves. Hann: Bell-shaped cosine window typically used to analyze continuous signals. Recommended for use when your signal content contains sine waves, a combination of sine waves, vibration data consisting of narrow band random signals, or unknown content. Hamming: Bell-shaped cosine window optimized to minimize the maximum (nearest) side lobe. Recommended for use when your signal content consists of closely spaced sine waves. Blackman-Harris: Similar to a Hann window, this window has slightly wider main lobe but much better dynamic signal range. It is optimized to provide the minimum side lobe level. Blackman: Similar to the Hann and Hamming windows, this window has slightly wider central lobes and less sideband leakage. Flat top: Optimized for measuring peak amplitudes of discrete spectral components that are separated by several spectral lines. Recommended for use when your signal consist of sine waves and amplitude accuracy is important. Band Inside: Triggers an alarm when the reading is within the range defined by the Low and High Frequency. Outside: Triggers an alarm when the reading is outside of the range defined by the Low and High Frequency. Type Above: Triggers an alarm when the reading at the selected Source channel goes above the Threshold.